Have you read the latest 360 research paper from Steelcase about “Defining the Code” of workplace culture? It provides some interesting insights into how organizations will have to change their thinking if they want to do business in a truly global marketplace. It’s not enough to simply acknowledge that people speak different languages. You need to take into account how everything from body language to work styles and interactions between employees differ across cultures. 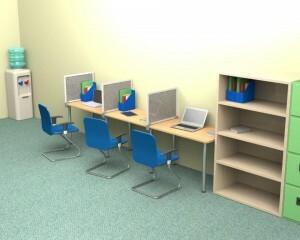 Then, you need to design the built work environment and select your office furniture accordingly. Basically, this refers to top-down organizational authority (autocratic) vs. everyone having a “voice” in how things are done at work (consultative). We actually see the full spectrum PDI here in the US, so it’s not impossible that our readers have worked in both types of organization at some point. The more autocratic workplaces are likely to be those that still have private offices for top employees. This work culture doesn’t necessarily place a high value on the whole collaborative meme that is sweeping the nation. They support teamwork, but don’t rely on their rank and file employees to innovate. They place a high value on productivity and effectiveness. So, they are quite likely to have cubicles rather than an open office design with no panels. This is a location where the judicious use of panel extenders to increase cubicle wall height could give employees an even greater ability to focus. The consultative style workplace is much more likely to have managers and other high level employees working out in the open as part of a team. The desk or benching style of office furniture tends to be quite popular here. However, things can get a little chaotic when everyone is having a conversation at once. While brainstorming can be fun, it can be distracting too. Adding privacy panels at the edges of a “cluster” of workers might help them become more cohesive and provide a bit of a break from the fishbowl style office where everyone can see everyone else all the time. Or, individual workers who request more privacy and those who have tasks that require more “heads down” time might like panels mounted on their desks. Will Panel Extenders Encourage This Trend?